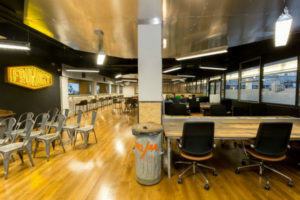 High-efficiency LED lighting and sensors have been installed throughout The Foundry – a new learning space and hub facility for enterprise and technological innovation. Described as an ‘industry-facing enterprise zone’, The Foundry is a new facility located at the heart of University of the West of England, Bristol’s Frenchay campus. 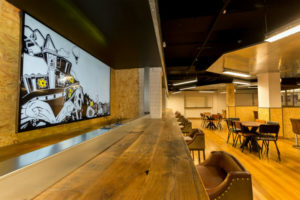 Occupying areas including the former Students’ Union bar, The Foundry has been established to provide a hub for enterprise and innovation – with a particular focus on developing the digital skills that the UK requires to compete successfully in the global digital economy. The new facilities were designed and developed in line with UWE Bristol’s stated emphasis on the continual improvement of its environmental performance through the implementation and review of objectives and targets. It therefore follows that energy-efficiency was a primary objective of the lighting system for The Foundry, prompting UWE Bristol Architectural Designer James Gray to put in an enquiry to locally-based lighting specialist Connected Light. The resulting installation utilises Glamox Luxo GIR LED industrial linear, highly-efficient fittings as well as daylight and occupancy sensors, ensuring that light is only delivered when and where it is required. The work was completed to time and to expectation, with Gray observing that Connected Light was able to achieve “an exceptional level of design. “We are very impressed by the work that has been carried out, and the quality and consistency of illumination that it has delivered to what is an extremely important addition to the UWE Bristol’s facilities. The lighting really had to be ‘right’ for such a flagship project – and it is,” concludes Gray. It’s an association that could be set to continue as UWE Bristol prepares to embark upon Phase 2 development work of The Foundry in the near-future.